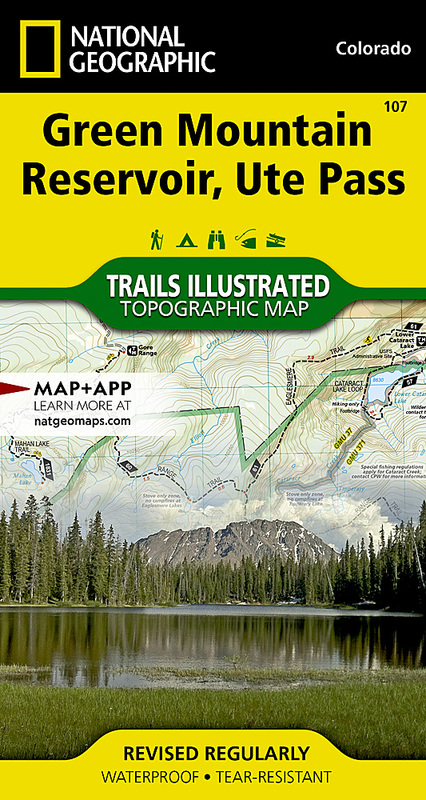 National Geographic's Trails Illustrated map of Green Mountain Reservoir and Ute Pass provides unparalleled detail for outdoor enthusiasts seeking to enjoy the region's year-round recreational opportunities. Expertly researched and created in partnership with the U.S. Forest Service, Bureau of Land Management and others, this map covers many popular recreation areas in and around White River and Arapaho National Forests, including Eagles Nest and Ptarmigan Peak Wilderness areas, Radium State Wildlife Area, Blue River, Williams Fork Mountains, Gore Range, Elliott Ridge,Green Mountain Reservoir, Cataract Lakes. Explore the area by following the map to pinpointed trailheads and then along mapped trails, labeled for hiking or motorized use. Many trails include mileage markers. To aid in your navigation, the map includes contour lines, elevations, labeled peaks and summits, water features, selected waypoints, areas of wooded cover and the Forest Service numbered road network. Some Forest Service roads are labeled for bike, cross-country ski or snowmobile use. Among other mapped recreation features are campgrounds, equestrian and primitive campsites, picnic areas, boat launch points, fishing holes (including gold medal fishing streams) and wildlife viewing areas. Provided are survival tips, wilderness regulations, Leave No Trace guidelines and essential contact information. Other features found on this map include: Arapaho National Forest, Eagles Nest Wilderness, Gore Range, Green Mountain Reservoir, Mount Powell, White River National Forest, Williams Fork Mountains.